When rats find their way into your home or office, Critter Control® of Fort Worth always recommends calling for professional help for your rat removal needs. Rats are an important part of our eco-system, but having them on your property is asking for trouble. They constantly chew on wood, electrical wiring, and even insulation to keep their teeth trimmed. Additionally, they are known to carry dangerous diseases like Hantavirus, Rat Bite Fever, and Leptospirosis. The Centers for Disease Control and Prevention has put in place a set of very specific guidelines for the disposal of rats after extermination. To ensure that any rats are handled properly, it’s best to leave your rat infestation up to the experts here at Critter Control®. Are there rats in your home, attic, walls, yard or roof ? Though some homeowners may have marginal success with using off-the-shelf poisons and traps, but eliminating an entire infestation and clean up should be left to the rat extermination experts. Our technicians ensure that the problem is handled in a way that keeps your home and family out of harm’s way. 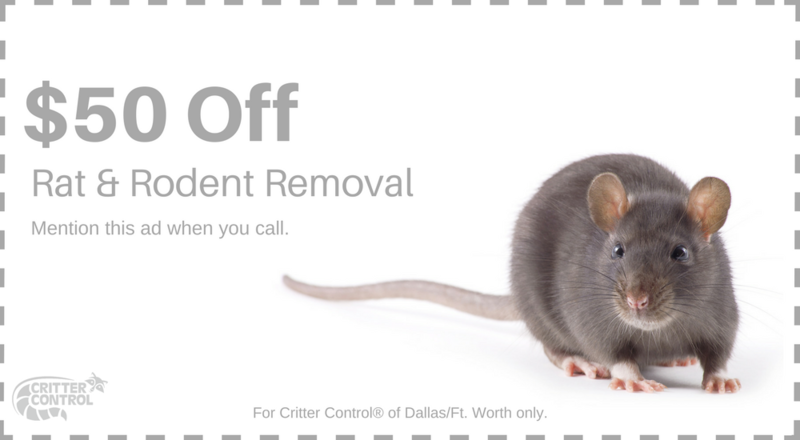 For any questions about our rat removal services or to schedule a free home estimate, call Critter Control® of Fort Worth today at 817.609.8302.